A 525-year-old copy of a letter by Christopher Columbus that was stolen from the Vatican was returned on Thursday after joint sleuthing by U.S. Homeland Security agents and Holy See antiquity experts. “We are returning it to its rightful owner,” said U.S. ambassador to the Vatican, Callista Gingrich, at a handover ceremony in a frescoed room of the Vatican Library, which houses tens of thousands of rare, historic items. While still at sea returning to Europe in February, 1493 - four months after discovering the New World - Columbus penned a letter to Spain’s monarchs describing what he had found and laying the groundwork for his request to fund another voyage. His original letter was written in Spanish. A Latin translation was manually printed in several copies and they became the main vehicle for spreading news of his find to the royal courts of Europe and the papacy. One of the Latin letters, printed in Rome by Stephan Plannack in 1493, found its way into the Vatican Library. Known as the Columbus Letter, it is made up of eight pages, each about 18.5 cm by 12 cm. But in 2011, an American expert in rare manuscripts received a Columbus letter for authentication and deemed it to be original. The year before, the same expert had studied a Columbus Letter in the Vatican Library and suspected that it was a fake because, among other factors, its stitching marks did not match up with those on the binding. 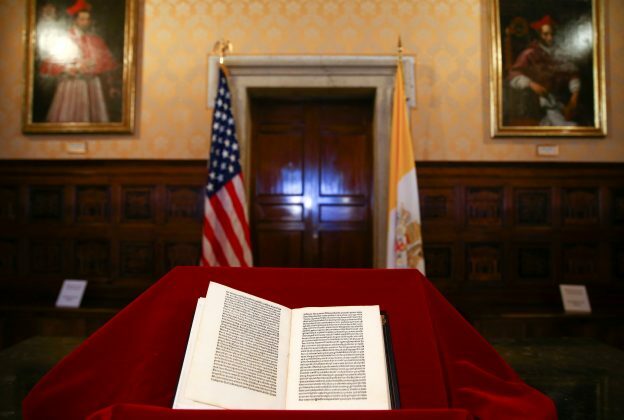 The letter in the United States, however, matched up perfectly to the binding marks of the leather cover of the letter he had studied in the Vatican. The expert, who was not identified, notified Homeland Security art investigators, who began working quietly with Vatican inspectors and rare books experts. They concluded that at some time after the authentic eight-page letter became part of the Vatican Library, someone took it out of its binding and replaced it with a forgery so good that no-one noticed. “We do not know exactly when the substitution took place. We will probably never know who the forger was,” said Archbishop Jean-Louis Brugues, the Vatican’s chief archivist and librarian. Homeland Security agents, who were present at Thursday’s handover, and their Vatican counterparts, coordinated the examination of the letters by other experts, including some at Princeton University. Their investigations determined that the authentic Columbus letter had been sold to a New York book dealer by Marino Massimo De Caro, who Homeland Security defined as a “notorious Italian book thief”. He is currently serving a seven-year sentence in Italy for the theft of some 4,000 ancient books and manuscripts from Italian libraries and private collections. The authentic letter was purchased in 2004 by the late American collector David Parsons for $875,000. After the investigations, his widow agreed to voluntarily return the letter to the Vatican Library. The letter is now worth about $1.2 million, officials at the handover ceremony said.